Prudenville bed and breakfast travel guide for romantic, historic and adventure b&b's. 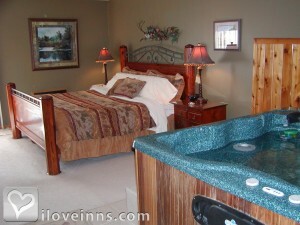 Browse through the iLoveInns.com database of Prudenville, Michigan bed and breakfasts and country inns to find detailed listings that include room rates, special deals and area activities. You can click on the 'check rates and availability' button to contact the innkeeper. Prudenville, Michigan is surrounded BY many rivers and also near lakes for great canoeing, kayaking, and tubing. Campbell's Canoeing is one of the best kayak and canoe rentals in town. In winter, Prudenville becomes a favorite winter destination. The cross-country skiing area is located at Higgins Lake. Other top attractions in town are Houghton Lake Historical Village and Playhouse and Pirate's Cove Adventure Golf. In the neighboring towns and villages, points of interest include AuSable Watershed Center, Cindy Lou's Zoo, Civilian Conservation Corps Museum, and Michigan Fireman's Memorial. From their Prudenville bed and breakfast inns, guests may also take a few minutes trip to Bottle-Cap Museum and Dawson & Stevens. In nearby Roscommon, the interesting spots include Crawford County Historical Museum, The Grayling Fish Hatchery, and Hartwick Pines Logging Museum. By Springbrook Inn.